Just a quick post to mention an extension for Chrome called Imagus. When you hover over a link or an image, it'll show you the enlarged version (as if you followed the link), or it'll follow and parse the destination image and show that. It saves you having to manually follow the link and hitting back. It's bloody useful - give it a try. Note: The Imagus extension has nothing to do with me; it's just damn useful. Just like the dopey FileSieve problem, I may have made a total dumb-dumb with Wake On LAN Ex. That problem where a user reported that WoLEX couldn't wake up a Buffalo TerraStation? It's because they use port 2304 for waking-up, and WoLEX wasn't actually taking any notice if the user entered a port that wasn't the default port 9. Thanks to A. Jones for investigating the issue. I've already written a large version of this post but it got nuked due to a technical issue; here's another version, albeit shorter. 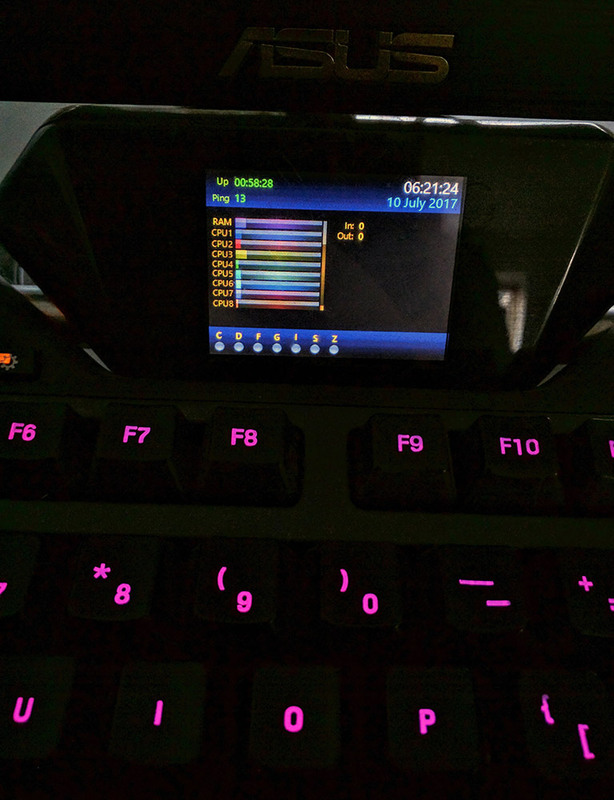 My current keyboard is a Logitech G19 and it features a lovely little built-in LCD screen, in addition to the array of extra keys that are typical on a Logitech device. Before I carry on, I need to expand on the screen somewhat. The screen, photo of mine to the right (reminder: sort out the horrible image CSS), is useless due to the lack of software. Logitech ship some little pointless "applets", such as a clock, that aren't all too useful. I decided to change that and write my own called Like a G19 (ha, a pun!). You can click on the link for more info, but briefly: LAG19 gives you a full visual WYSIWYG editor that allows you to place various controls down to show information. It takes the LCD screen from gimmicky-but-useless to extremely useful. I put a huge amount of time into it and yet I haven't worked on it for a couple of years, let alone released it. Shame. I've always used mushy rubber dome keyboards, but not out of choice; it's just the prevailing tech for keyboards - even this aforementioned £130 keyboard. Back in the 1990s I do remember Nimbus computers at school and the buckling spring keyboards sounded awesome; not that I knew that at the time as I was an Amiga idiot and everything PC sucked. I recently gave some mechanical keyboards a quick test at some computer shop and... loveliness. Not perfect, as they weren't buckling spring or Cherry MX Blues, but close. Just missing that nice, loud click. I've been occasionally looking at mechanical keyboards for the past year and still haven't bought one. The problem tends to be the feature set: thery typically aren't complete enough. MX Blues, but no multimedia keys? Multimedia keys but no Blues? Blues, but no RGB lighting? It's so frustrating. Although the Logitech G910 Orion Spectrum is mechanical, it uses some custom switches called Romer-G rather than the Cherries I'm looking for. Grr. Someone give me what I want! Uh-oh, I received a report earlier today saying that Wake On LAN Ex isn't waking up Buffalo TeraStations. Considering that WoLEX is waking up other devices fine, I'm inclined to believe there could be a configuration problem with said TeraStations, or even the network to some degree. I've asked if the app is able to wake-up other devices on the network and will decide what to do depending on the answer. If not - or n/a - then I'm not sure what the plan of action is, in all honesty. I could try adding another way of implementing the WoL functionality, but I'm still confused why the existing method would only wake some devices? Okay, I've decided that I'm going to move this to the main BootBlock.co.uk domain tomorrow. I'm going to move over all of the previous articles and posts to this blog-thing in the morning as some may find them useful, and then see what happens when I shove the lot over. Unless I decide to add more features to this before putting it on the site proper. Days and days to even work out why plugin settings weren't being set correctly and getting no-where, then this morning, within a couple of minutes of loading the project... it's fixed! The issue was when a Profile was set, the Profile's active Method ("a method of sorting files") wasn't being initialised (which, among other things, passes the relevant settings on to the plugin). This doesn't make much sense as that's something that must have been happening previously otherwise it wouldn't work in the past. Was it broken all this time? Nineteen releases and no-one's mentioned it? Even I didn't realise? But, it's fixed, and I've created a new build and sent it to the user mentioned in previous posts to see if his original issues are fixed. If they are, then it'll be time to release 4.20 - a release all FileSieve users should update to. Someone just sent me a couple of photos of their hairy arse. There's a gigantic issue with FileSieve and its plugins' settings. The wrong settings are being activated for the wrong Methods/Modifiers. And it's an absolute nightmare to work out why, or where, or anything.